Student interacts with HTC Vive virtual reality system in the newly-opened VR Lab. The laboratory looks like a cross between a classroom and a tech pavilion at the annual Consumer Electronics Show in Las Vegas. There are virtual-reality headsets everywhere, and large flat screen 3-D displays. College students work at computers, while teammates wearing goggles look from side to side, occasionally ducking or recoiling, as they react and engage with the virtual environments visible in their head-mounted displays. Welcome to the Virtual Reality Lab — the first of its kind at an American university. Schulze — a research scientist and VR expert in the Qualcomm Institute — co-led the project with Music professor Shahrokh Yadegari, who also directs the Sonic Arts Research and Development group in the Qualcomm Institute (QI). In the winter quarter, Schulze used a not-yet-fully-outfitted VR Lab to teach 3-D User Interaction (CSE 165), requiring students to develop interaction techniques for the Oculus Rift and other VR devices. The course previously focused on user interaction design, with less emphasis on 3-D. 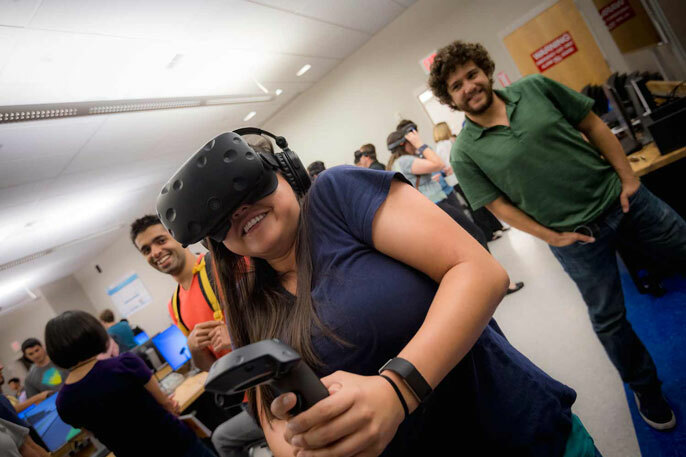 This fall, CSE assistant research professor Nadir Weibel will teach Ubiquitous Computing (CSE 118), and he plans to use the VR Lab to give students the ability to understand the limitations and opportunities of VR and augmented reality, focusing on a ‘mixed reality’ surgery app he and his students are developing. At the open house, Weibel and Gasques-Rodriguez demonstrated an early prototype of the app on a Microsoft HoloLens system. It uses ‘mixed reality’ — i.e., real medical scans of the patient draped over a virtual computer model of the same patient in 3-D — giving the surgeon with goggles a kind of “X-ray vision”. Last quarter, Music professor Shahrokh Yadegari — whose team developed the surround-sound audio library for the lab — taught Music Technology (MUS 176), focusing on spatial audio and VR applications. Students were given access to the lab to learn how to combine audio and video for the total VR experience. Looking to the future, Schulze is revamping his Computer Graphics course (CSE 167) to include a hands-on component applying graphics to 3-D virtual environments. He is also adapting his VR curriculum to learners around the world — through the first-ever (recently announced) series of online courses on VR App Development over the edX learning platform (jointly with CSE professor Ravi Ramamoorthy, director of the Center for Visual Computing). The first course launches May 15.